January 29 – January 31. 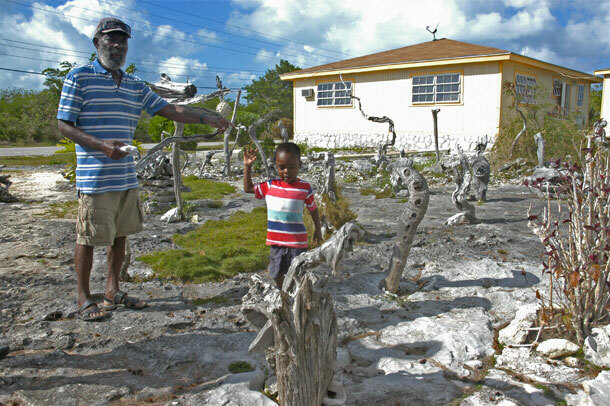 Willy and his adorable grandson show us his driftwood pieces in the Garden of Eden. Black Point has got it figured out. Provide free Internet, cheap drinks, and a Laundromat, throw in roadside attraction and they will come. They, of course, being boaters like us. 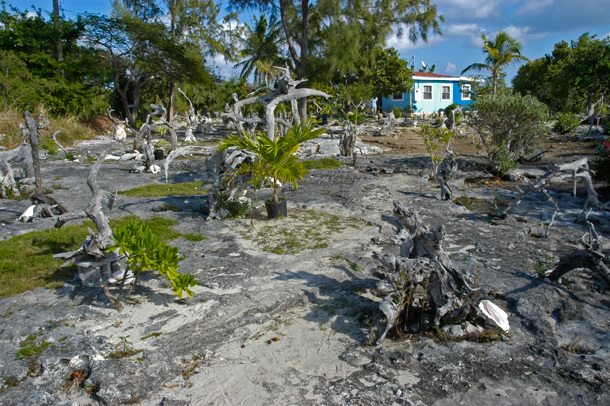 A traditional Bahamian settlement, Black Point is small community on the island of Great Guana Cay. 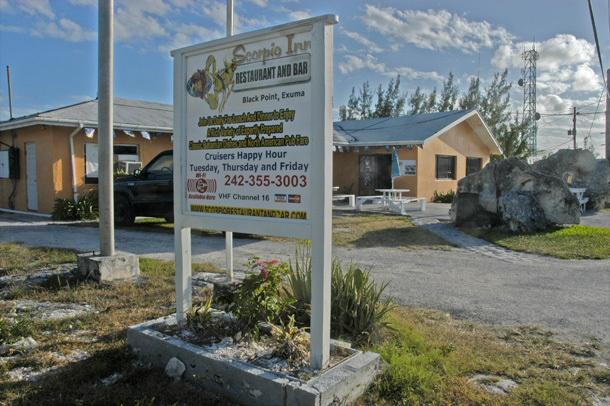 There are no big marinas or resorts there, just friendly Bahamian people making their living by doing straw work, farming, fishing, and running small businesses geared to cruisers. The anchorage at Black Point was packed when we arrived, but after a couple of attempts we found a spot we could squeeze into without feeling like we would end up playing bumper boats with our neighbors. As in any new town, our first mission ashore was a recon trip. We cruised down the main drag, through the grocery store (decent stock, but no lemons), in and out of the Rockside Inn Laundromat (clean with nice machines, busy, but not packed), past the two main cruiser hangouts, Lorraineâ€™s and Scorpio (made a note to come back), and down the road past a large yard decorated with driftwood (which we would soon learn was the advertised â€œcruisers must seeâ€, Garden of Eden). 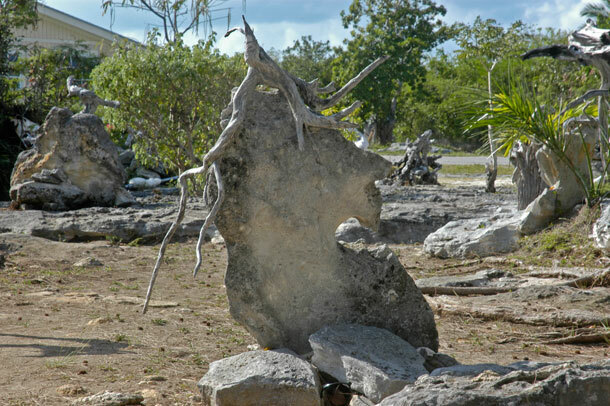 Our guide and creator of the Garden was Willy, a retired security guard who was inspired by seeing shapes in the clouds to seeing figures and animals in driftwood and rocks. 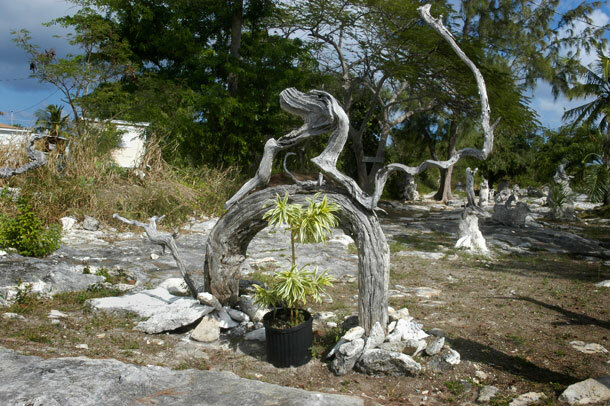 His front yard was a menagerie of time and water worn branches and some stones created by Mother Nature and realized as art by our host. He explained to us what he saw in each piece and encouraged us to see the Lions and dancing girls ourselves. 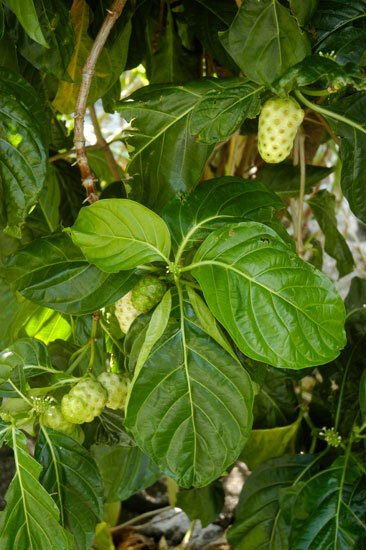 Behind Willyâ€™s house was a garden of sorts with tropical fruit trees, squash plants and even a lemon grass plant growing out of the crevices between rocks in the harshly landscaped backyard. Willy explained how he would just throw seed out and see what came up. He told the crowd what each plant was and offered a member of the group a taste of unripe tamarind, explaining the Bahamians use it to add a little tartness to their drinks. The taste tester was a little hesitant to try anything else after that, but gladly accepted a ripe mango, later, when he offered. Back down the road we stopped into Lorraineâ€™s, a cozy little spot where beer is only $3.00 and you are welcome to serve yourself and keep your own tab. We chatted up a cruiser at the bar (while his wife did all of the important work of keeping up with email in the computer lab adjacent to the restaurant) until it was time for happy hour at Scorpio across the street. Scorpio offers â€œhappier hourâ€ for cruisers on Tuesday, Thursday, and Friday with $2.00 wine, $7.50 for two rum punches and $3.00 beers. We were there on a Tuesday and Scorpio was happening. There we met more boaters and learned the reason Black Point was so packed. Everyone was making their way down to the Little Farmers First Friday in February Festival. It sounded like a good time and we started to consider jumping down there with everyone else, but first we had to address an increasingly dire situation, dirty clothes. The next day was laundromat day. Luckily we had nothing else planned because apparently it was laundry day for half the boats in the anchorage. While the wash was going, I took some time to make a few blog posts with the ever-present Black Point open wifi connection and Greg caught up with all of the important news we had been missing (which seemed to only to be revelations about Jim Naborsâ€™ love life). While waiting for dryers, which took twice as long as the washers, we connected with more travelers and sampled some conch fritters and banana bread sold by the laundromat/marine supply store/snack shop. The next day we set sail for Little Farmerâ€™s, nine miles south. We decided we would come back after the festival and explore beyond the settlement and take more advantage of some of the attractive Black Point amenities, cheap beer and free Internet. Willy said this was some kind of animal, but Greg thinks this one, like many, are dancing girls. Lioness looking over her left shoulder. Guanabana fruit in Willy’s yard. 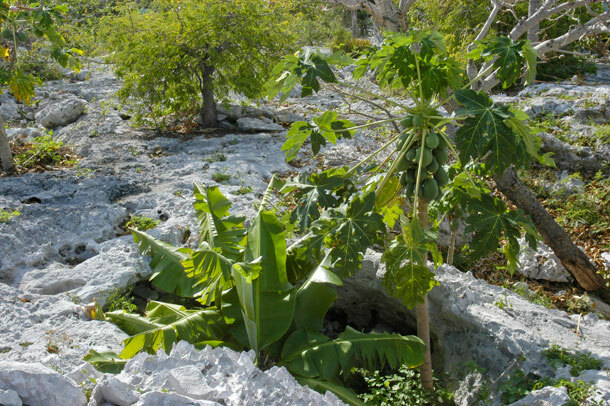 A banana tree and a mango tree grow out of the rock in Willy’s backyard. 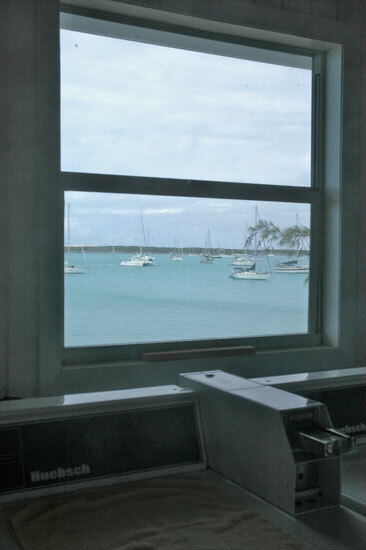 Doing laundry is so much better with a view like this. 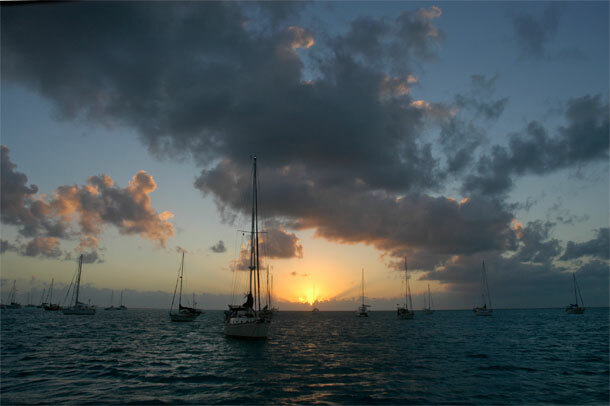 The sun sets on the packed anchorage at Black Point.